The well-known Gherkin building in the City of London is up for sale, following the appointment of Phil Bowers, Neville Kahn and Alex Adam of Deloitte LLP as the Joint Fixed Charge Receivers on the landmark office building. 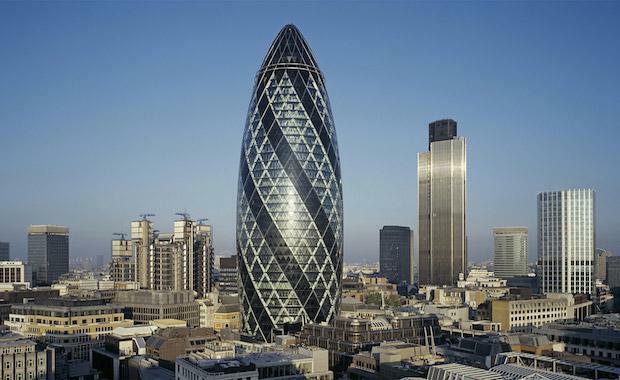 Designed by Lord Foster, the 40-storey skyscraper at 30 St Mary Axe, opened in 2004 and is currently multi-let to approximately 20 tenants including Swiss Re, Kirkland & Ellis International LLP and ION Trading. Savills and Deloitte Real Estate have been jointly instructed to sell the iconic 46,914 square metre office building. “This is a prestigious appointment on what is a globally recognised landmark building, which sits in the heart of London’s business core." “The Central London commercial property market has benefitted from improving market conditions over the course of the last few years," Stephen Down, Head of Central London Investment at Savills said. Marketing is about to commence with interest expected to come from all corners of the globe. “The Gherkin is one of London’s famous landmark buildings and the most iconic office tower in the City’s skyline." “For investors, this prime office property provides an attractive combination of stable and reversionary income with opportunities to add value via asset management." “The property will appeal to a wide range of domestic and international investors and we are confident of maximising returns to the receivers and creditors," Jamie Olley, Head of City Investment at Deloitte Real Estate said.